LOS ANGELES, California (CNN) -- Guns N' Roses became Guns N' Roses N' Lawyers this week. Guns N' Roses frontman Axl Rose finally released "Chinese Democracy" in November. The band, which released its first album in 17 years last week, has found itself in a legal tussle with soft drink giant Dr Pepper over a promotion turned awry. Dr Pepper rolled out a marketing campaign in March promising a "free soda" to "everyone in America" on one condition -- Axl Rose, lead singer and frontman for Guns N' Roses, had to "finally release his 17-year-in-the-making belabored masterpiece, 'Chinese Democracy,' in 2008." Guns N' Roses, often called GN'R by its fans, released the album last week. And Dr Pepper followed through, posting a coupon on its Web site for a can of soda. There was one catch: fans had 24 hours to go the Web site and print out the coupon. So many GN'R fans -- and, no doubt, fans of free stuff in general -- tried to get the coupon that they choked the site and it crashed. Disgruntled and downright ticked off, some blamed the band. "When you go on the blogs and you read the responses from the fans, they associated Axl with this promotion ... and blame him for the fact that they didn't get their free soda," said GN'R lawyer Laurie Soriano. That's when GN'R became GN'RN'L. Soriano fired off a letter to Dr P. No one is LOL. Her letter asked the soft drink company to make good on its offer. She has yet to hear back, Soriano said this week. "We've gone public with the fact that we are not involved but are trying to clean up the mess," Soriano told CNN. Dr Pepper told CNN it had "taken great steps" to keep up its end of the bargain. It said it extended the window for the giveaway from 24 to 42 hours, added a toll-free line to handle consumer requests for the coupons and set up an interactive voice recorder to accept coupon requests. None of those measures are still in effect. "Additionally," the company said in a written statement, "for those who contacted us in the week after the giveaway about difficulties requesting the coupon, we continued to offer free coupons to address any problems they may have encountered." That may be so, but the band still wants an apology. "The door to a lawsuit being filed is always open until the fans are taken care of and Dr Pepper has done the right thing," Soriano told CNN. The band may have other concerns. 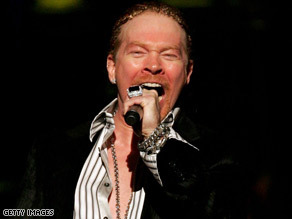 "Chinese Democracy" received mixed notices upon its release, and some bloggers are blaming Axl Rose for the new album's reception. "The album was beaten to the top of the UK charts by The Killers' 'Day And Age' on Sunday," the British music news site NME.com said Tuesday in a segment labeled Today's Top Gossip. "Sources have said that record bosses are fuming because Rose has been AWOL for the last two months -- meaning he hasn't done any promotional work for the album." And an official Chinese Communist Party newspaper was widely reported as describing "Chinese Democracy" as a "venomous attack" on China, accusing the band of turning "its spear point on China." As Rose once sang, "Welcome to the jungle. It gets worse here every day."